I'm not really a party person, let alone a proverbial 'snappy dresser', but recently for a friends birthday had to find something suitable for a James Bond theme. We thought about renting a tuxedo, but that turns out not to be all that cheap in Montreal, so my wife, being the star that she is, went searching. She acquired a tuxedo, that fit me far better than it had any right too sight unseen. It cost a whole $10 from a thrift store. The plain white shirt I wore with it cost several times more than this tuxedo. You could tell it was well made, in that way that you don't always get these days. It was tailored, well tailored. 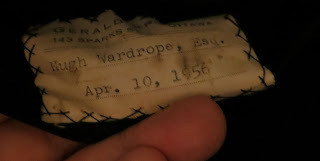 Afterwards we then found a label folded away on the inside . . .
A name. A place. Things that spark imaginations and thoughts. 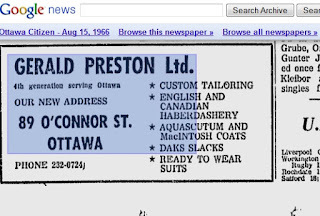 Some Google digging didn't reveal much about the person, aside from some much older references about a family by that name who moved to Ottawa from Scotland. The Tuxedo though was also old, very old. 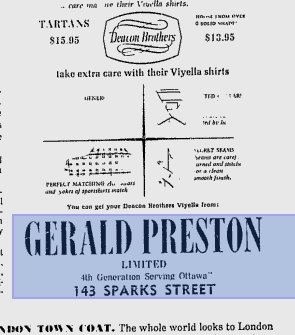 Testament to the work of Gerald Preston Ltd, They apparently served the fine people of Ottawa for four generations, at least up to 1965 ... how do I know this? 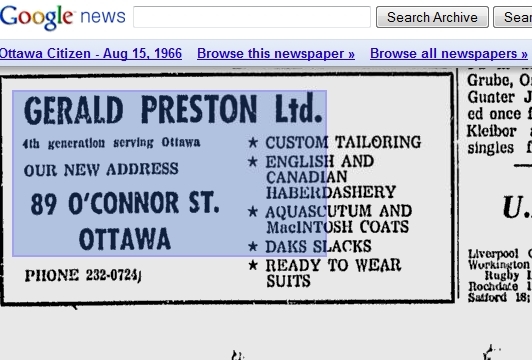 Google of course, and in this case, saved scans from Ottawa newspapers! That Google can find these references from the pre-digital age, never ceases to amaze me on occasion The last reference from them was in 1966. Which in turn lead to a few hours of looking up old photos of Ottawa in the 50s and 60s, but couldn't find a shot of the store, but learned a little about the area and the times. That is the value in old things, they can teach us things, remind us of times past, and inspire all kinds of stories. Something about a thing like this that just excites the writer in me. The tuxedo has a story, I may not know much of it, but sometimes that is the beauty of it ... just knowing that there might be a story. You can imagine the adventures from a different time, which would make even the mundane and everyday have an exotic appeal of an unknown time. A finely made tuxedo that has stood the passage of time and will continue to see new chapters added to it's story now it's in new hands. Ten dollars ... a small price to pay for a little history lesson. It was also a great evening out in an old Tuxedo, and adds another appeal to writing a few more pages yet, even for one such as me, who usually shys away from parties and such activities that normally requires a tuxedo.